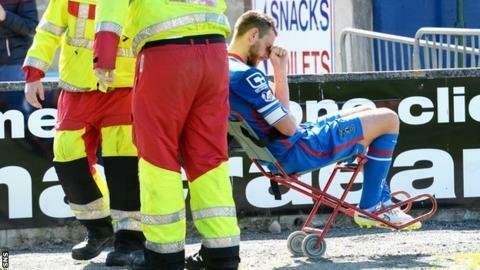 Inverness Caledonian Thistle have confirmed the injury suffered by defender Gary Warren was "a break". The 30-year-old was taken to hospital with what appeared to be an ankle injury after a strong challenge by Stephen Pearson during the 1-0 home defeat by Motherwell on Saturday. Caley Thistle said on Sunday: "We can confirm that, unfortunately, Gary Warren's injury is a break." The club added it would give an "update on the prognosis when we know more." Warren's injury compounded a bad day for John Hughes' men, who last season finished third and won the Scottish Cup. "We need to roll our sleeves up and get that underdog mentality," Hughes told BBC Scotland. "I've just got that vibe since I've come back that one or two are thinking they're better than they are. "I've said to them: 'Football owes you nothing.' If you think you're better than you are, it'll come and kick you up the backside." Wes Fletcher scored on his debut, before Caley Thistle goalkeeper Owain Fon Williams saved a Scott McDonald penalty. "I'm seeing a lot on the training pitch," said Hughes. "The training pitch tells you a lot when you're seeing the quality and guys scoring goals. "The ball retention was very good but far too slow and too sloppy at times." Motherwell retained their Premiership status with a 6-1 aggregate win over Rangers in a play-off last season. And manager Ian Baraclough said his players are ready to carry on from where they left off. "I'm a bit greedy - I think we could have taken one or two more chances," he said. "We dealt with the way they played. They had a lot of possession of the ball, it didn't really hurt us, didn't really get in behind us. "We've got to capitalise on our chances. As the second half went on, we got deeper and deeper as the legs began to tire and that can be costly. "When we break, we can break at real pace. You do need a goalscorer, I think we've got several in the side. "We'll improve. We'll improve the fitness levels as well."